I'm still a somewhat new Lupin III fan, I'm one of those who's first exposure was The Woman Called Fujiko Mine. But since I've seen The Mystery of Mamo, Castle of Calgiostro and a handful of the TV specials. I'll check out Blue Jacket soon, it seems like it won't get a Dub, so it may be first time checking out Lupin III in Subbed form. I'm also a fan of the original Arsene Lupin, though I'm only getting started there also. I currently have Arsene Lupin Vs Countess Cagliostro, next I intend to get Arsene Lupin vs Sherlock Holmes: The Blonde Phantom. I've read the first few short stories LeBlanc wrote which are pretty easy to find online. I also watched the 2004 film in French with English Subs. The Damsel with the Green Eyes is a Lupin Novel that is currently easier to find in Japanese then in English, the Englihs version, Arsene Lupin: Super Sleuth is long out of print. 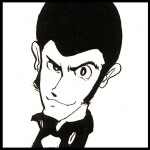 So I've often speculate in my mind if that particular Lupin novel might have been a particular influence on Lupin III. Particularly if the interesting female characters I've heard it has could be partially the inspiration for Fujiko Mine. I would never compare Fukiko to Josephine Balsamo, Josephine is Evil, Fujiko isn't. The Girl (Damsel) with the Green Eyes/AL:SS was an influence on Miyazaki at least: Jodot was named after a character in the book, and the personality of Clarisse from Castle of Cagliostro is based on the female lead (though her name came from the Countess Cagliostro novel, of course). But as for the book influencing Monkey Punch's character? I personally doubt it. Really the only things I'd say Mr. Katou borrowed from Arsène Lupin novels are: Lupin's an expert burgler, the mystery element in each story, and the "calling card" he (sometimes) sends to his victims-to-be. MP's comics otherwise felt nothing at all like Leblanc's books, which is probably why it stands on its own as an IP instead of getting sued into oblivion early on for swiping the name (also reportedly, Japan used to be lousy at recognizing international copyrights). That said, I'd love to have a copy of AS:SS. I DO have an old copy of The Woman in Grey, Miyazaki's inspiration for using both a clock tower and a hidden treasure. I wish someone would digitize it so I wouldn't have to, though. Being first published in 1886(? ), the book's well into the public domain, I reckon. Zenigata is a modeled after Ganimard clearly. That's interesting to know about Calgiostro, thanks. The character Green Eyes I mainly think might be Fujiko like is Constance Bakefield, though I was disappointed to here she is killed off early on. The other influence is of course Zenigata Heiji, famous fictional japanese detective who would stop the criminals by trowing coins at them. I dunno what the source is, but I seem to recall that Fujiko is largely based on the "[James] Bond girl" concept (though originally he started by making a variety of one-shot Bond girls all named Fujiko, he later treated them as one person with varying fashions/hairstyles, then later still standardized her appearance). Yeah, Zenigata as a policeman foil for Lupin is indeed based on Ganimard, but the two's relationship is, as Red Dear suggested, also based on Tom & Jerry with more goofy antics. But Ganimard being so relentless in his pursuit and knowledge of Lupin (whose grandson Miyazaki materialized for a terrific Part I TV episode) had to have been a source for Zenigata, whose ties to Heiji Zenigata are (I think) a little more superficial. Zenigata is a very different kind of character from Ganimard, but Ganimard's basic role is what he plays. Though Ganimard isn't as consistent a presence. Fujiko definitely has a bit of a Bond Girl vibe. Thing is I often wonder how much Flemming was influenced by Lupin, he certainly was by Bulldog Drummond. Arsene Lupin's friendly and respectful rapport with Ganimard in the story where he's been arrested definitely reminded me of how his grandson treats Pops in the anime.I think the anime owes more to Lupin and Ganimard's relationship than Monkey Punch does. Lupin III and Zenigata have more of a friendly rivalry in the anime, even helping each other out when it calls for it, or actually mourning when believing that the other is dead. Zenigata trapping Lupin, Jigen, Goemon, and Fujiko on an island, then escaping via boat. He says a few words (in the Italian translation, anyway) about how Lupin probably saw through his disguise, and that he always lived for the challenge. Then he detonates a bomb under the island, seemingly killing the gang. The last few pages are just of Pops watching the smoke clear. Not something I could ever see the anime version doing. I thought Richard Epcar announced that Blue Jacket was indeed getting a dub? Anyway, welcome to the forums. It may not seem active, but the fans here are quite passionate about Lupin. with the exception of the one who voiced Zenigata. However, I don't think we have an official airing date.